Riding the tractor to the wedding. [Beginning of email cut for brevity…] So, my 2nd night at Utopia, I was having fun with the bartenders (a group of about 8 Laotians stuffed behind a small bar) asking them how to say certain things like “I love you” and then constantly using my newfound phrase everytime I passed the bar. So one bartender, who I’ll call “Kai”, talks to me and says something like “You come to my sister’s wedding Friday?” and I ask him some details and ascertain that he seriously wants me, a stranger, to come to his sister’s wedding in his home village, and the wedding will last from Friday to Sunday, and his village is about 2 hours away and we will ride motorcycles there. I say “I don’t have a suit” and he tells me to wear a t-shirt. Sounds like my kind of wedding. His brother-in-law is waiting to take us the rest of the way. Or rather, his soon-to-be-brother-in-law, as this is the brother-in-law whose wedding is starting in about 5 hours. This would be a theme throughout the weekend. The groom and bride carried dishes, moved furniture, took care of young kids, etc., always with the same stoic expression – a scowl. It’s not that they were mad, it’s just the expression all Laotians carry naturally – a scowl. So, the vehicle that would take us the rest of the way can only be described as a giant lawnmower with a wagon attached in back to carry passengers. Kai’s brother in law would sit between the lawnmower and the wagon and steer the lawnmower from a small wooden bench – he would occasionally jump off the bench and walk the lawnmower around sharp turns. We could have taken a taxi down this wooden road, but there was only 1 per day, so we missed it. This trip on the lawnmower wagon (I’ll call it a tractor), was 2 hours. 2 hours sitting on the floor of a wooden wagon. 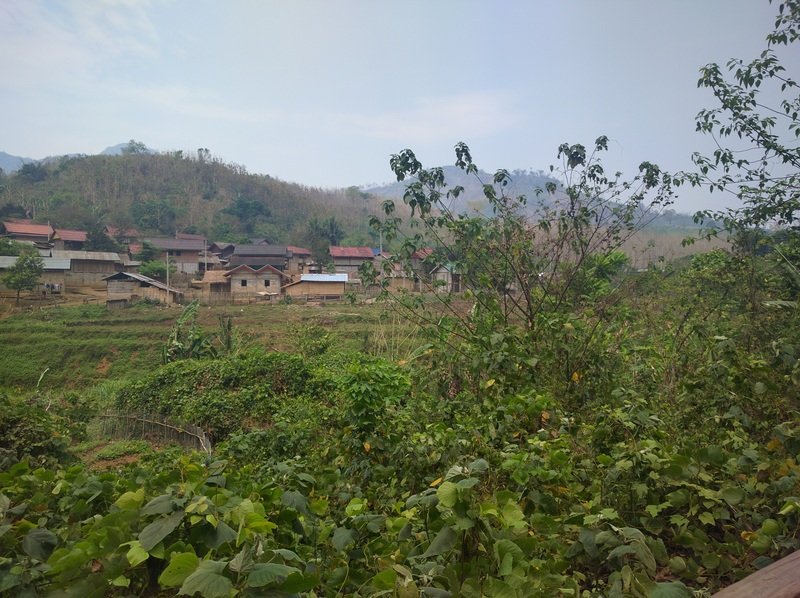 So that was about 15 kilometers at 7 kilometers per hour, meaning our 3 hour trek from Luang Prabang to Kai’s village was 3 hours to go about 50 kilometers, or about 30 – 40 miles. 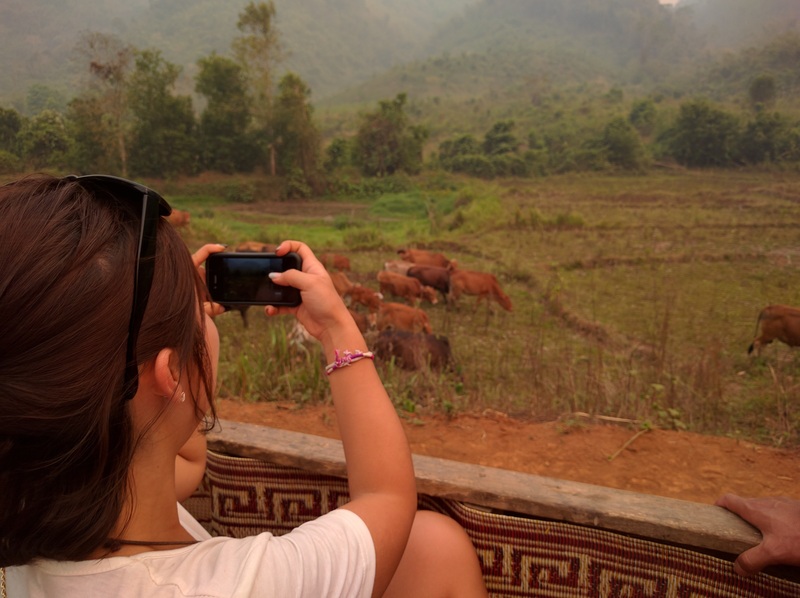 Welcome to Laos. People drive this dirt road on motorbikes often, and you can fit a pickup truck down it, but Kai said the last time he drove his motorbike down it he “crashed 2 times, no 3 times!”. And remembering this he laughed heartily. This is what he meant by “the road is bad.” We also crossed a river about 6 times, which was 2 feet deep at places. Not ideal for a rented moped and a driver with 2 weeks experience (me). So we get to the village. By this point, Kai has told us that his village is Khmu. 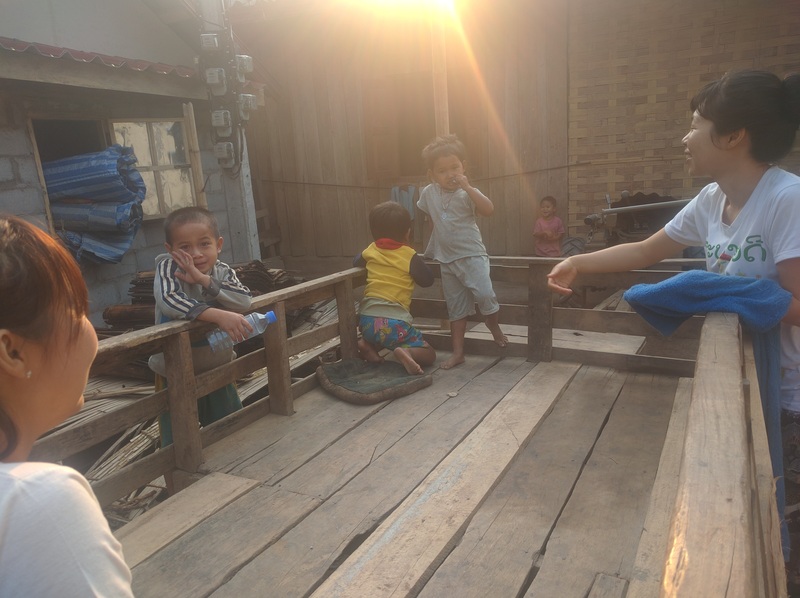 So, they don’t speak Laotian, they speak Khmu. They understand Laotian, but it would be rude to speak it, so we have to learn new phrases again “Hello” “Thank you” “My name is”… actually I forgot “My name is” by the time we arrived in the village so all I could say was “Hello” and “Thank you.” Naturally, we arrive in this village of clustered houses, some made of cement bricks and tin rooves, some made of wood and bamboo (“Those houses last 2, 3 year,” said Kai). – Here is how a Laotian (or Khmu, I guess) wedding works: At about 5pm, you eat dinner. Dinner is sticky rice, pork soup, and spicy banana peel salad. This is in fact every meal for the rest of the weekend, except for a bowl of straight pig’s blood that was served the next morning for breakfast, complete with shriveled up veins. I drank this thinking it was still “pork” because I couldn’t differentiate between Kai’s pronunciation of “pork” and “blood”, though I understood once I tasted it (they did add chili to the blood). By the way, you eat the rice with your hands – you just make balls with it and then eat the rice balls, then you all share a big bowl of soup. The old game of Hang on the Arm. OK, that’s part 1 of the wedding festivities: dinner. Part 2 goes on for the rest of the night and has no variation. It consists of the Laotians blasting Laotian pop songs on what appeared to be a set of borrowed speakers (nobody knew how to use it or the mixer, also they played the same 5 or 6 songs all night) and after each Laotian song, one of the village members would come on the mic and (again, very loudly) read a good-luck wish that had just been written by one of the villagers. By the end of the night, all the villagers had written one of these notes to be read aloud – sort of like our speeches by the parents or best-man, but one happens after every single song. But then, most of the attendees don’t appear to really be listening to these speeches, which last about a minute each despite being only like 3 lines on a piece of paper. Instead, a lot of the younger attendees rush from the dancing area (in the courtyard) into the 1st floor of the house to sip “Lao whiskey,” which is homemade rice wine fermented in giant ceramic jars. After a minute of the speech, another song comes on, and everyone rushes back outside where a few of the villlagers dance while the others watch. Wash, rinse, repeat. All night. I lasted til 3am, about 2 hours longer than the Korean girls. -When the Khmus drink, they just pour rice wine in a plastic cup, hand it to you, and say what amounts to “Chug this please.” You chug it and hand them back the cup which they immediately fill again and hand to someone else. You can also sip directly from the jar with a long straw. – Dancing is taken seriously. You are expected to dance the Khmu style, standing opposite a woman, and slowly shift the entire circle of dancers to the left. – You are provided a steady stream of sunflower seeds as a sort of bar snack. – Apparently the bride and groom did an initial dance alone to start the night, but I didn’t see this. – I may have missed this because there were 2 girls who began leading me to and from the dancefloor inside to drink rice wine and then back to the dancefloor. – These girls were about 14 or 15, so they were looking to get married and have babies soon. – In the city, this age can be much older – 30 yrs old is still a socially acceptable age for marriage. – I forgot: on Friday, shortly after arriving, Kai asked us if we wanted to shower. 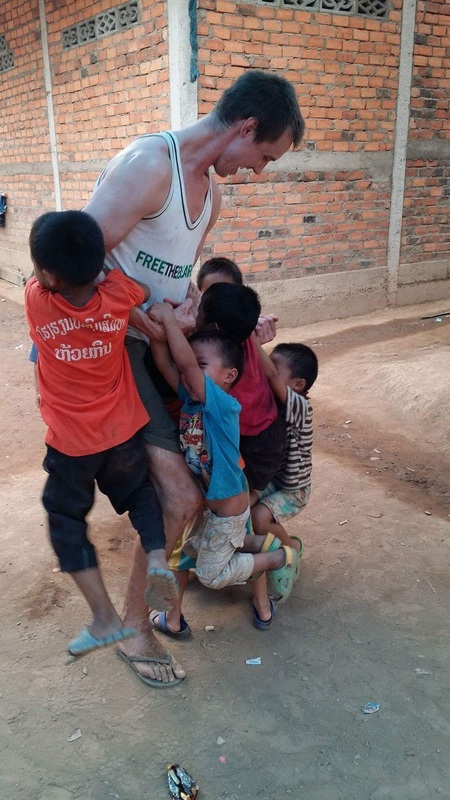 We accepted and before I knew it I was separated from the Korean girls and a group of toddlers and little children grabbed my hand and led me to the river, where they all got naked and splashed around laughing. I kept my shorts on, considering the teenaged girls who were also trying to shower around the riverbend. – The town had electricity but each house just had one lightbulb hanging from the ceiling, which stayed on all night for some reason. Some houses had a television and a satellite dish outside as well. – Saturday night we foreigners were exhausted from drinking all day and having children literally hanging off our arms so we went to bed at 8pm. – Also, Friday, when we had just about reached the village on the tractor, a man approached our wagon and Kai’s brother in law slowed to a halt. The man, scowling of course, heaved a stack of about 100 small bananas onto our wagon. He said a few words, Kai said a few words, and we pulled off. “Who was that?” We asked. Kai: “My brother”. After confirming this I asked when had last seen his brother. ” 2 years,” he said after some thought. Yes, 2 years and no big, no elaborate greeting. Just…take these bananas, please. – Kai lives 3 hours from his village but hasn’t seen his family in 2 years. -Everyone in Kai’s village is a farmer except for the teacher and the elderly (who are maybe 40 or 50, 60s at most). -Saturday morning we were awoken by the strong smell of smoke…because they were cooking on the 1st floor, and they cook with an open fire. – They also burn their crops in order to clear the weeds for new rice planting… This is common all over Southeast Asia in March and April and has been a constant smog since I landed to Sinagpore , but nowhere as strong as in Kai’s village and the surrounding area. We passed several burning fields on the dirt path to his village. -Kai’s village is called Huagin in English, which he could not spell for me, but his fellow bartender wrote down for me. That’s about an hour and half of writing for me and $2 of Internet cafe money followed by me typing on my phone and losing all sense of punctuation. I’ll have to follow up with Thailand Malaysia and Singapore soon! Miss you all and let me know how life is! See you in June.